January 31, 2011 – Free Hot Water, a U.S. based solar thermal manufacturer and distributor, has created a new solar iPhone news app for the latest solar industry news on-the-go. 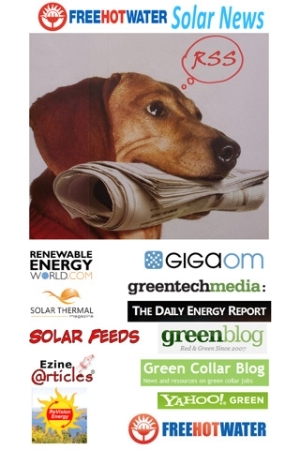 As a national solar hot water company, the staff at Free Hot Water reads many solar and renewable energy news sites. But to get their full daily buzz of solar info on the road, they had to download and navigate through multiple solar news apps–or, worse, read the news via the iPhone’s browser. While many individual iPhone apps exist for individual solar news sources, no single application brought all of the staff’s favorite news feeds together in one place… until now. Introducing the Free Hot Water Solar News App. This free iPhone app encompasses some of the most informative solar news feeds on the web in one little, easy-to-use application. Download it, and solar pros will find some of the best home-grown solar company blogs, as well as top online solar magazines, green career sites, and of course, Free Hot Water’s own popular solar thermal blog.